The image of a German monk nailing a revolutionary document—The 95 Theses—is inspiring and iconic. For this reason, some who don’t know much about Martin Luther and his legacy turn first to those theses from 1517. When they do, they are often confused. At this stage in Luther’s development, he hadn’t worked through all the implications of his discovery. What was important about those theses was that, unlike many prior reformers who attacked the abuses and excesses of the church, Luther dismantled the whole system of selling salvation. For this reason, Luther indeed changed the world with 95 theses. 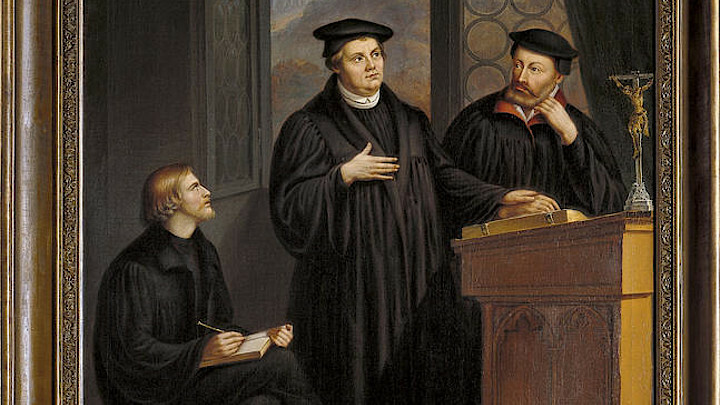 But I believe that Luther’s chief contribution to theology occurred on April 26, 1518, through 28 theses he drafted for the Heidelberg Disputation. In this document, Luther presents his greatest insight: the importance of being a theologian of the cross. He contrasts this mode of thinking with a theology of glory, which assumes that we mount up to God on the steps of our own religious edifice. Luther contends that even our best spiritual, theological, and moral efforts are insufficient to save us. Rather, he calls us all to the foot of the cross, where all our religious expectations are turned upside down. In late medieval theology, some came to think that God graded people on a curve. “Do your best, and God will do the rest,” they thought. As reasonable as that sounded, Luther knew all too well that such thinking ultimately created a deep anxiety. After all, how can we be sure we’ve done our best? 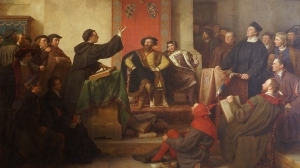 In thesis 16, Luther wrote: “The person who believes that he can obtain grace by doing what is in him adds sin to sin so that he becomes doubly guilty.” If our standing before God didn’t depend on our moral excellence, Luther realized, it certainly couldn’t depend on our own mediocre “best” efforts. Luther explained in 1518 that God is typically hidden from our direct view in this world of danger, struggle, and suffering. This is particularly important in our day. Even as Christians, we too often desire cultural dominance and material success. We want to be winners. And we want our winning to serve as an indication that God is on our side. Yet we find ourselves in difficult times. Rumors of war. Mass shootings. Cultural animosity. Petty infighting amongst increasingly irrelevant Christian sects. Loved ones suffering with addiction, or depression, or cancer. It can seem gloomy. Luther didn’t develop his theology ignorant of the painful realities of life. He stared into the abyss of anxiety. He looked the devil in the eye and threw an inkwell at him. (He also farted at him!) Luther could do this because he knew that the hidden God is the God of humbled losers. Luther’s insight here is now 499 years old. But it still seems lost on far too many Christians today. It’s not that we don’t suffer, it’s that we don’t think we will meet God in our suffering, but instead focus our efforts on building stylish buildings and personal spiritual preening. We must continually be reforming and repenting of glory theology. That’s why we here at 1517 do what we do as an organization. Some people mistakenly think that the work of 1517 The Legacy Project will culminate with our upcoming 500th anniversary of the Reformation celebration. No. Our desire is to re-center ourselves and our communities on the core insight of the Reformation—the Gospel—and then apply its implications to our lives and legacies for the next 500 years. After we enjoy our celebration, we will still face the daily struggles of life. We will have more to learn. We will have new questions as new challenges face us. For this, we need to cultivate and support young Christian leaders who will be the sort of people who can understand and communicate a theology of the cross in a culture addicted to glory. We need to raise up young men and women who, freed from false religion by the theses of 1517, are able to apply the insights of 1518 to life in the year 2018 and beyond. This isn’t messing about, friends. This isn’t just an abstract theological game we are playing. Our network of friends isn’t trying to create some new cult, or new club. We are trying to remind ourselves and our fellow Christians what Luther proclaimed in 1518. We won’t change the name of our organization to 1518, of course, but we will continue, in the years to come, to call us back to the foot of the cross. Please stand there with us in the many years to come.